Susan Evans is the director of creative services for the senior strategic communication team at the College of William & Mary. When I google “William & Mary Class of 2015,” the top result is the Facebook page we created for incoming students. In just a few days, these bright and hopeful new students will show up on campus for orientation. They’ve been active members of our community for months. William & Mary Class of 2015 on Facebook launched on December 1, 2010, first as a community for early decision admits. As William & Mary Dean of Admission Henry Broaddus states, “early decision students already bleed green and gold.” So we intentionally allow the enthusiasm about William & Mary to simmer away on Facebook for a few months while the rest of the class is admitted. In late March, another 4,000+ were notified about the Class of 2015 Facebook page. The Undergraduate Admission team hosts the Facebook party while students are deciding. Admission selects a group of current students (Tribe Ambassadors!) to field questions and generate discussion within the online community. Don’t misunderstand the intent, a primary goal is to convince the best students to attend William & Mary. By May 1, some percentage of admitted students become enrolling students and the wildly enthusiastic orientation team takes over the management of the Facebook page. Throughout the summer months, orientation staff post reminders and instructions, but the bulk of the conversation is, as it should be, among the enrolling students. Since December 1, this enthusiastic crew of incoming students also started (and continued) 81 discussion topics covering everything from “Rock Climbers? ?” to “Favorite Books” to “Need a cheap minifridge?”! This is how they do it. Raised with online communities, using social media as a support system for one of life’s biggest transitions (leaving home and going to college! ), is the way it’s done. Connecting with potential roommates, remembering to sign up for classes during a particular time slot and beginning to see yourself as a put-your-college-name-here student are just a smattering of the possibilities on Facebook. Lurk. Yes, the official staff sponsors should be part of a Facebook community for admitted and enrolling students. But think of your role as a mostly silent partner. Offer concrete instructions and reminders about deadlines and, of course, step in to correct the facts. Otherwise, appoint current students you trust, and let the conversation go on without you. These are paying customers. Student-centered. Period. (Well, actually, a bit more.) Don’t underestimate the time it takes to read and respond to Facebook content. Be certain that current students who are employed to participate in the community understand the ongoing commitment. Giving your customers what you promise requires follow through. Hey, what about me? Your grandmother is on Facebook, so assume parents of your prospective and incoming students are part of the equation. (To the relief of my 20-year-old daughter and her 23-year-old brother, I learned to clip my helicopter tendencies because of my responsibilities for communication related to admission and new students.) The Class of X Facebook page is for the students, but anticipate parent participation and decide early on how to handle their posts and comments. All in all, I think Facebook is a flexible and powerful way to start a community that effectively recruits and orients students. Luckily, move-in day comes around annually and practice makes perfect. Nice Pic dude!! 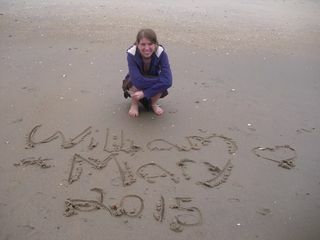 William and Mary 2015 on Facebook page was awesome , I have just visited the page and really outstanding. This kind of Social media strategy to get in to the students was appreciated. Thanks for sharing!! Hi Susan, this is really great. We currently also have a Class of 2015 page at our institution that is extremely active. Ours is actually a group compared to a page. Was it easier for you to get the data because it was a page? I’d like to put together the usage data for our group but have yet been able to figure out how to do it. Thanks! Keep up the great work! Wow, I was already composing a similar post in my mind about the wild success of the Oberlin 2015 Facebook page! Great educational minds clearly think on similar trajectories. As a now-recent grad, my incoming class (class of 2010, so in 2005/6 when we were applying) was the first year that Facebook was available to high school students. I have the student-driven Oberlin College Class of 2010!!!!! group to help solidify friendships and boost my excitement during the seemingly neverending summer before I began as a student in earnest. After the incredible experience I had “meeting” my new classmates on Facebook (and lamenting the lack of knowledgable assistants when questions popped up, ranging from questions about classes and campus to mail and musical audition times) as an incoming first year, I volunteered my over-abundant knowledge every year after, both as a know-it-all-student and later, as an academic ambassador, to each incoming class. It’s wonderful to see the growth and development of how the incoming classes use the page each year, and it’s lovely to read about the success at W&M as well! What are your reasons for going with a page vs a group? Is the “William & Mary Class of 2015” group on facebook also one of your creations, or was it done without your involvement?